The best recipes tend to be those that are deceptively simple, absolutely delicious and take very little time to prepare. Inevitably, they're also the dishes that we prepare over and over again. 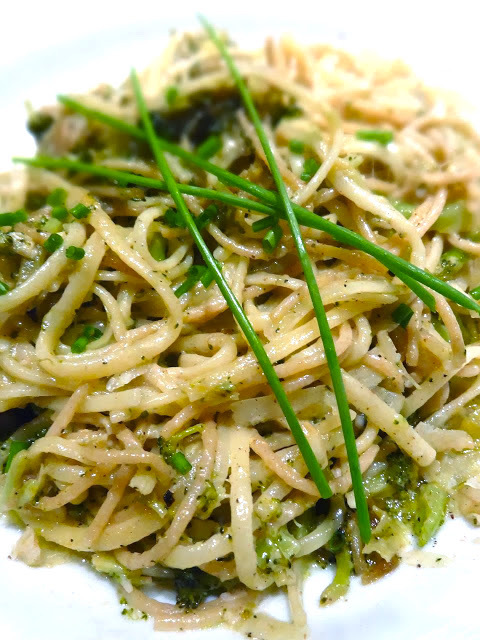 This easy and inexpensive Broccoli, Leek & Anchovy pasta sauce is one of those recipes. The key is to sauté the broccoli, leeks and anchovies in olive oil until they virtually dissolve into a luscious paste that coats the pasta for a delicious and soul satisfying simple dinner. Add the oil and butter to a sauté pan over medium heat. When the oil begins to warm up, add the chopped leeks and cook until soft, about 6-8 minutes. Then place the broccoli florets and chopped anchovies into the pan and cook, stirring and mashing the mixture with the back of a wooden spoon, to dissolve them as much as possible into a paste. You may need to add a little more oil if the mixture becomes too dry. Add some fresh cracked black pepper, then taste for seasoning, adding a wee bit of salt if you like, keeping in mind that anchovies are already quite salty. Meanwhile, bring a large pot of salted water to a rapid boil over high heat and cook the pasta until it is 'al dente' - firm yet tender. Drain the pasta in a colander placed into your kitchen sink, shaking off excess water then toss into the sauce and toss to coat. Add half of the grated cheese, and toss thoroughly once again. I added a little cream at the end for some extra richness and finished with a garnish of fresh chopped chives. The pasta should be served immediately with the reserved parmigiano-reggiano on the side, for guests to serve themselves.